So meet our U.S. President of the week: Harry Truman! There’s a lot we could discuss here. I’m just going to mention the highlights, and if any readers want to add more in the comments, please go ahead. As World War II was drawing to a close, Truman became president in 1945, after the death of President Franklin D. Roosevelt. Weeks into his presidency, Truman made the hard and controversial decision to use the atomic bomb against Japan. After the end of World War II, Truman was instrumental in establishing the United Nations. For better or for worse, America would now take an extremely active and leading role in international affairs. He also oversaw the enforcement of the GI Bills as the American servicemen came home and re-entered civilian life. The Soviet Union refused to give up the European Territory it had captured in the last weeks of World War II. Communism became America’s new enemy, and the Cold War began. Truman introduced the Truman Doctrine, which basically stated that the United States would use resources (economic and military) to prevent the overthrow of democracy in free nations threatened by Communism. The Truman Doctrine was an important precedent during the Cold War. Truman was president during the Korean War (1950-1953). I believe the Truman Doctrine is one of the most lasting precedents from his presidency. It firmly established the American stand against communism and a willingness to combat it economically and militarily. While its interpretation may have caused trouble farther down the road, the precedent and decisive action was good. 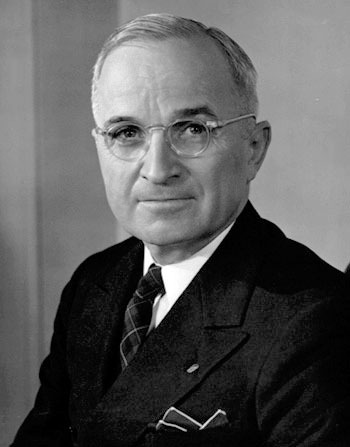 Two of Truman’s best character qualities were decisiveness and humility. He could make a decision, follow through with action, and defend his choice. On Truman’s desk in the Oval Office was a sign which read “The Buck Stops Here.” He was the president; he could and would make decisions. He was humble. He wasn’t looking for glory. He could make fun of himself and had a pretty good sense of humor. He was a president who could make hard decisions and get things accomplished. He took responsibility. He was humble. He was “down-to-earth.” He loved his family. He liked to play the piano while his daughter sang. I like Harry Truman because of his humility and his “common American” attitude. As I mentioned at the beginning of this post, Harry Truman seems like a person who you’d want as your next-door neighbor. Well, Mr. Truman is not alive any longer, so I will never have him as my “presidential next door neighbor.” But it does make me consider: what type of person (neighbor) do I want to be? I’d say we Americans have a pretty good example in the unpretentious, patriotic, humble, and humorous character of Harry Truman. Happy Belated Presidents’ Day, Harry S. Truman! P.S. Which U.S. President would you want as a next-door neighbor? His modest office at the Truman Presidential Library is pretty impressive. He also recorded a greeting and “virtual tour” of the reconstructed Oval Office there. Sounds great! I’d like to plan a trip to the Truman Presidential Library the next time I’m in Missouri.